A fairly roomy youngs gastropub which is probably more gastro than pub these days however, was not the case a few years ago. A place that does get busy and very popular with staff from the adjacent Kingston hospital. People I have know to have worked at the hospital told me that it is affectionately known as Albert Ward. Interior is fairly modern and trendy since the place was refurbed around 8 or 9 years ago. I personally used to prefer it's slightly tatty charm before but I guess more people prefer it in its current guise as it seems to get more punters. Plenty of tables out the front for sunny weather and a nice patio garden with heaters around the back if you want to get away from the main road. Definitely worth a visit if you are in that part of Kingston! 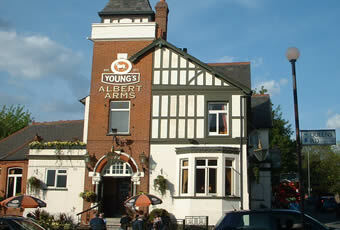 Youngs pub that appears to have gone a bit upmarket and appears to be more for diners than for drinkers. No tables were available in the main part of the bar and a smaller area near the entrance. Yet there were around a dozen empty tables reserved for diners to the one side of the bar. Not really conducive to a lengthy stay, as you can't get comfortable propping up the bar. Youngs Bitter, Special & London Warmer were on, alongside Caledonian Deuchars IPA. Was amused to see the Eastern European barmaid's expression when she was asked for a Black & Tan! The car park is impossibly small, considering everybody seems to park there for the nearby hospital. There are many better pubs in Kingston. 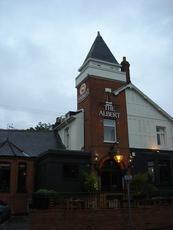 A days strolling around Richmond Park led to lunch at The Albert. A a curious pub it is too. The traditional welcoming Youngs sign outside leads you into a pub with with a number of different levels, with even a basement bar. Tables are spread widely throughout the pub. The place is fairly sparsely decorated but still has a pleasant ambience. Youngs Bitter, Special Bitter, Gold and Wells Bombardier available. 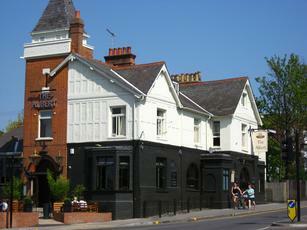 Many have said it before, but Youngs just isn't the same now it comes from Bedford and not Wandsworth. Not the pub's fault, and what we had was fine, but it's Youngs in name only. Lunchtime food options were interesting. Most offers were large sandwiches, e.g., a long oval plate sandwiches on a skewer, with an option of a full portion of chips or a "handful". Only main meals were Steak and Onion Pie or Lasagne. I plumped for the chicken club which was very good. Food offers may be different in the evening. The two ladies serving were very attentive and made us feel welcome. Not a bad pub. Quiz nights on Weds. Check out the nurses from the hospital on some nights (?) Winter Warmer when on early this year was a cracking pint. Can get very busy, gonna get even busier when the Olympic road race goes past. good beer and very good food. Lovely.